Two Days Old - May 27th 2010: This is the first day in our home for the first chicks I've ever owned. They seem so delicate and tiny. I already love them to no end. Everytime I hold one in my hands, it seems to calm and immediately drop off to sleep. They took right to eating and drinking within the first few seconds of being placed in their homemade brooder and are quite active. I was quite surprised there were so many as I had only ordered 10 but after further reading, I realized that the extra chicks of indeterminate breed are male and used to increase the heat in the box in which they were shipped. I'm feeling a bit insecure as their caretaker and "mamma" and I hope to catch on quickly, for their sake. Thank goodness for BYC! I had a few last minute questions and posted them on the forum. They were quickly answered and everyone was so kind to encourage me. Three Days Old - May 28, 2010: Bad news first. I lost a chick last night. I hate when things die! At any rate, the chick looked like it had died in its sleep. There didn't seem to be any clue of distress, no body fluids, just a precious, gentle little chick passing into eternal rest. Luckily, I believe God has room in heaven for all creatures so, perhaps it's happily chasing bugs in the great beyond. There was also a pleasant surprise. 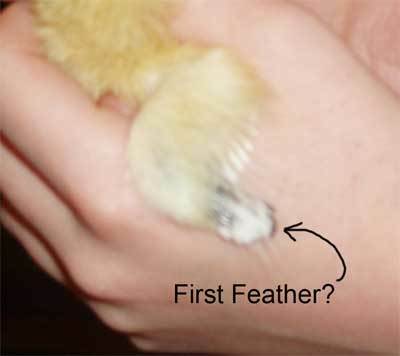 On many of the chicks, white feathers are appearing on wingtips. The one pictured isn't the best example but you can kind of get the idea. The little things have grown overnight! The box they all fit in quite nicely last night suddenly is overly crowded. I wasn't expecting this much growth overnight! 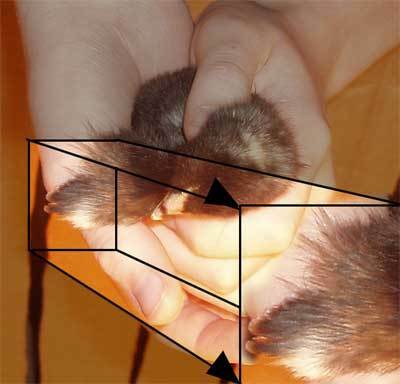 This evening, I'll be looking for a deeper box with more floor space for them. They will also be getting their first dose of vitamins and electrolytes tonight. We looked for mealy bugs at MFA but, apparently they don't carry it. I did find parakeet grit which I've read works for young chicks when they start eating treats. I guess we'll have to go bug hunting over the weekend. Last night I traded in their warming lamp to a better quality and for once, they aren't stacked atop one another. They spread out a bit, assumed nesting positions and went right to sleep. Perhaps I was allowing it to get too cool. I was a bit alarmed when I walked in this morning to a completely silent room however, it seems they were all sound asleep. They woke fit and feisty which pleased me to no end! Today, I took a shot of one of the black chicks wings. Yesterday, there were none but today, they seem to have caught up and possibly surpassed the yellow chick's feather development. 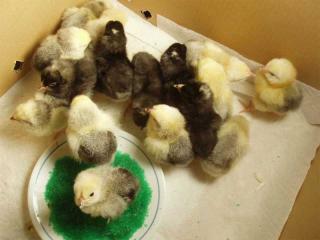 The black ones seem to be growing faster and are more assertive than the yellow chicks. I had a chance to observe something I'd not seen or heard from them previously. One of the black chicks stood up and let out with a sound that sounded like a very loud trill. Could this be a very premature crow? From what I've read, that requires several weeks worth of growth so, maybe I'm reaching on this one. I am becoming more persuaded that the black chicks are the males. One of them is nearly head and shoulders taller than the others. He seems to have taken charge over the flock and when the others sleep, he acts as lookout.... until he finally falls victim to sleep himself. I am one happy camper with my little ones and I love observing them! They are such sweeties! Eleven Days Old! June 3, 2010: It's been a few days since I've posted due to memorial day weekend and lots of entertaining but, I have to say, I found it hard to tear myself away from my little ones. I think we've developed quite a relationship now! If I slowly lower my hand into the brooder, the little guys and dolls will jump right into the palm of my hand. There seems to be absolutely no protest at all when I hold them or tend to them. Oh... regarding the loud trill made by one of the black chicks; I've not witnessed it since then. Not sure what it was but, I've not heard a similar sound since. I still believe the black ones are my roos but, I'm certainly no expert! Their development seems to be faster than the yellow chicks in several ways. 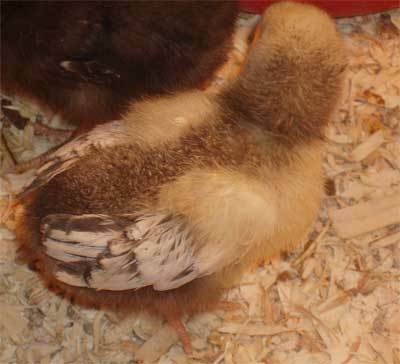 Granted, the yellow chicks were the first to get wing feathers but now, the black ones seem to be starting with comb and tail feather development, pictured below. To the far left you can clearly see the chicks head and, if you look closely, there seems to be little bumps on the top of the beak. Now, I have no idea if that's what a developing comb looks like since these are my first chicks but, it certainly looks like it to me. The other pictures the bottom half of the same bird. however both pictures have been enlarged for the purpose of showing more detail. 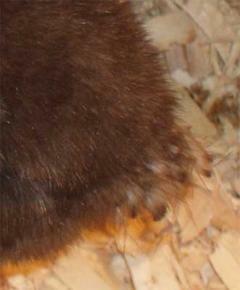 Upon very close inspection, I'm hoping you'll be able to see the tiny feathers emerging from the soft chick fluff. And yes, I examine them all this closely everyday. How sad am I? *laughs* I am amazed not only by their development and quick growth but their personalities as well. Amongst all my chicks is a little yellow runt. Her actual development seems to be right on par with the others, she's just much smaller. Strangely enough, she seems to have the biggest personality of all! I'm considering naming her Miss Diva. Twelve Days Old - June 4, 2010 No pictures today because there isn't much visible difference since yesterday. I am overjoyed because I finally succeeded in offering them a treat they enjoyed! I've offered them many things that have been recommended on the forum and all met with dismal results. I put down some canned tuna (with spring water, no oil) and sat expecting them to begin gobbling it down. At first, they looked at the plate and then at me as if to say, "what hath mom wrought?". They approached it cautiously, seemed to sniff it and then turned around and walked away. For about 20 minutes I sat thinking that I was just experiencing the latest wave of "bad momma" syndrome. Just as I was about to remove it from the brooder, I had an idea. I took bits of the tuna and put it in their feeder. Ten minutes or so passed and nothing happened so, I went back to reading. 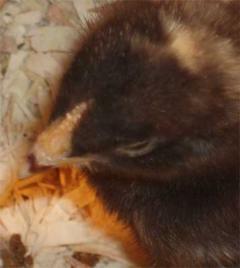 All of a sudden, I became aware of the biggest ruckus I've ever heard from that brooder! I peeked back in to watch them all running about, flapping wings, kicking their litter all over the place. I couldn't help but think they were sensing the presence of a preditor unseen by me. Finally, I realized that one chick had a morsel of the tuna in his mouth and was running away from all the others. Seems he had tried the tuna and quite liked it. Suddenly the paper plate containing the tuna was completely covered in chicks and they were pecking fast and furious! It was not unlike dipping a frog into a pond of piranha. By the time the chicks left the paper plate, it was as clean as it had been when I pulled it out of the kitchen cabinet! Momma learned a lesson. I need to allow them to discover the offering is food! I have learned that the black ones are cockerels indeed but thanks to the forum and Boo-Boo's Mama, I now know they are Barred Rock. I do have one Wyandotte who is bigger than all the others but, there is no sign of a comb or anything else that would make me believe it might possibly be a male. Well, I guess time will tell!